Live comedy has lost much of its anarchic, punk spirit and become more ‘corporate’. That’s the view of the performer behind the Stockport housewife character Barbara Nice, Janice Connolly, speaking at an ‘in conversation’ event at the Leicester Comedy Festival last night. The lack of representation hasn’t stopped her from landing her own Barbara Nice sitcom, which starts on Radio 2 next month following a 2015 pilot. And she admits she has written the show – a studio-based sitcom – with one eye on a transfer to television. That nod to Mrs Brown aside, Connolly admits that ‘it’s really hard to write a sitcom’. The commission for the initial pilot came after producer Rebecca Papworth invited TV and radio executives to watch a selection of comedians – also including Ted Robins, Gavin Webster and Tom Wrigglesworth – perform on a barge in Salford. From that showcase, Barbara Nice also snaffled the job of doing the warm-up for Vic and Bob. In fact the accolade that year was shared between Neil Fitzmaurice and Dom Carroll. But from that gig alone, Connelly got signed with Johnny Vegas’s agent (before deciding to go it alone) and was seen by both Papworth and Peter Kay, who’d won the previous year. He subsequently cast her in That Peter Kay Thing and Phoenix Nights. 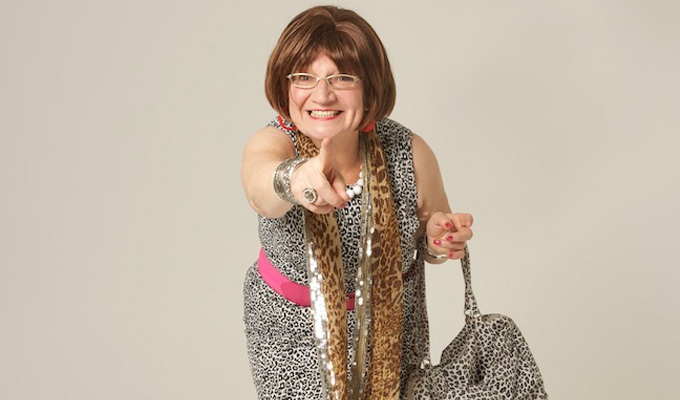 As well as her acting and stand-up, Connolly has also long been involved with projects that take comedy and theatre into the community, which earned her a British Empire Medal in the New Year Honours. She teaches people about stand-up – claiming ‘I can make anyone get laughs from an audience for three minutes’ – buy says her courses are designed to build confidence, not as a stepping stone towards a professional career. ‘Not everybody who does a comedy course should do it to be a comedian,’ she said. Connolly is currently working on a Birmingham-based project that brings gang members and older Afro-Caribbean women together. ‘It can break down isolation,’ she said. ‘The sessions seems very alive. It’s brilliant – and Dead Funny – makes you feel great and makes a difference. The character came about on the Birmingham circuit as a way to connect with audiences as an older woman. She started as a faux mother-and-son double act with a comic genuinely called Reg Nice, before going it alone when he emigrated. Inspired by the way she’d seen Frank Skinner interact with the audience, she said she learned her craft at Birmingham’s Gag Club, where she was the regular host. Asked the inevitable question about women in comedy – and goaded by a man in the audience who ‘ironically’ trotted out the line that women aren’t funny, Connolly would only say there wasn’t always an equality of opportunity. She recalled her first booking outside Birmingham, at the Buzz Club in Chorlton, when promoter Agraman warned her that the audience were bored of female comedians talking about periods. Women in comedy the subject of the next scripts she hopes to get off the ground, a radio show based around the pivotal moments in female comics’ careers, with each 15-minute show involving the women talking to a male interlocutor in the dressing room. But before that, there’s the small matter of the Barbara Nice radio show, which goes out on Radio 2 from March 13, starting with the pilot programme then four new episodes over the following two weeks.